You, Me and Movies: Review: "Deadpool 2" is wackier, crazier, and bloodier than before. Review: "Deadpool 2" is wackier, crazier, and bloodier than before. When the first "Deapool" movie came out two years ago, there was no secret as to what audiences would be in for if they stepped into that theater. The attitude was present from the early marketing, and it was impossible not to see what was in store for people. There haven't been too many R-rated superhero movies yet, especially one that seem to embrace all the vulgarity, all the violence and all the danger that comes along with that rating. Though I'd argue "Deadpool" isn't good simply because its for adults. What the movie does well is completely embrace the material its adapting, better than any other superhero franchise out there. Not only that, but it has so much fun poking holes in the old superhero concepts that it was hard not to love. As superhero movies continue to come out of the woodwork by the double-handful, it gets very tough to rate films in a franchise. I can't say if I prefer "Deadpool 2" over the first film. Not yet. Sure, some have been so great that they stick out from the rest of their franchise (i.e. "The Dark Knight" and "Captain America: The Winter Soldier") but by and large, these superhero franchises really feel like the comics that are being adapted. "Deadpool 2" feels like a continuation of what happened before, the next big episode in an ongoing television show. As we get more and more adventures with these superpowered beings, its harder to rank their films. I have thrown that idea out the window. I just like seeing where these characters go next. I can't say that Deadpool, once again brought to magnificent life by Ryan Reynolds, does not disappoint with this matter. In the opening moments of "Deadpool 2," he's already made fun of the movie "Logan," and blown himself up with a flying middle finger jetting toward the audience. Yep, this is Deadpool alright. If you couldn't stand the Merc With A Mouth the first time around, I am not sure this second film will sway you. Deadpool busy here, killing bad guys in the most creative of ways. Constantly breaking the fourth wall. Saying and doing things the wrong person will find offensive. The movie continues to bend and break the rules of the superhero movie. 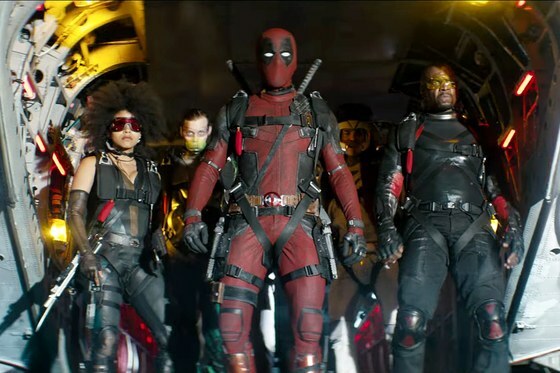 In the middle of this sequel, Deadpool recruits a team for the film's big finish. After parachuting out of a plane, the entire team aside from one person is dead, unable to land their parachutes. The movie is a wild ride from beginning to end, incredibly self-aware and dazzlingly tongue-in-cheek. It never once apologizes for what it is, so you are either going to take what you see or leave it. 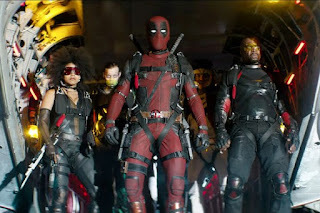 The opening of the film leaves Deadpool in tragedy, so to blow some steam off, he goes to the X-Mansion and reconnects with Colossus (Stefan Kapicic) and Negasonic Teenage Warhead (Brianna Hildebrand) and he decides to go on a mission with them. Which leads them to Firestar (Julian Dennison) who is wreaking havoc at a mutant orphanage. Deadpool and Firestar have a bit of a tussle, which leads them to a mutant prison. But don't worry folks, they don't spend too much time there. Cable (Josh Brolin, playing his ten thousandth comic book character of his career) has come from the future to hunt Firestar, who will eventually lead a life that will get Cable's family killed. So the plot is much more comic booky than the first film, which was all about the villain of the film trying to get Deadpool to call him by his real name, not his code name. The first film was very much a total joke on the superhero genre, while the sequel puts much more emphasis on family, unity and togetherness. Those fans expecting another one-note joke may be disappointed. This is one of those sequels that added much more heart to the equation, but to me, it was in a very subtle way. The movie remains playful and wacky throughout, just like the first film. I don't know what's going to happen in the future, as there is talk about Fox being acquired by Disney. Its especially mysterious since Comcast swooped in and muddied the water with an offer for Fox too. IF Disney ends up with more Marvel properties, I sincerely hope that they keep Ryan Reynolds as Deadpool. He really gets the energy of the character, he gets him, he understands him, he is Deadpool in the flesh. It would be wrong to recast him. Kapicic, Hildebrand, T.J. Miller, Morena Braccarin, Karan Soni and Leslie Uggams all return from the first film, and they continue to add wonder to this very weird world. Josh Brolin has a knack for these Marvel characters, although Cable is nothing like Thanos, he still does an incredible job bringing him to life. Cable is a ferocious badass in this movie, and Brolin embodies that perfectly. There is a cascade of cameos that any X-Men and Marvel fan will enjoy seeing. There are actors in here that you'll never expect to turn up, but they do. Watching these cameos fly by while accompanied by the goofy jokes will make fans both cheer in delight and laugh their asses off. Zazie Beetz is a wonderful addition to cast, playing Domino whose power is that she's lucky. That may sound like a goofy superpower, and believe me, there are plenty of jokes about it in the movie. But surprisingly, she's a complete badass, and how luck plays into the action scenes is quite fun. I liked Julian Dennison ever since I saw him in "The Hunt For The Wilderpeople," which is one of Hollywood's best kept secrets. He was a little God in that movie, and he's a little God in this movie too. Deadpool doesn't seem like he's going to be changing anytime soon, and that is something we can agree is a happy thought. This continuation of his story is just as wacky as the first go around, so if that was fun to you, enjoy the ride once again.